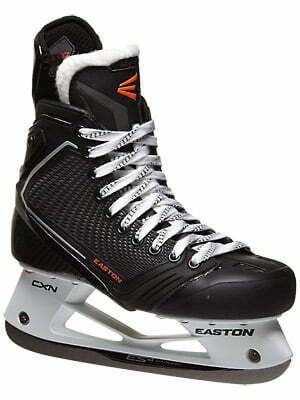 Easton Mako II Sr Hockey Skate | Sports Etc. Downforce: Aggressive blade pitch allows you to get over the front of the skate and drive more force into the ice. Push Direction: Asymmetrical patterns allow the skates to fall in line with direction of travel to generate speed and power through cornering. Tempo: The combination of the active Extendon™ guard and deep contour design creates the Mako’s unique skating system for unrestricted natural movement. The evolution of explosive skating continues with the Mako II. With design enhancements to the composite bootform, a more responsive tongue, upgraded ankle padding and the introduction of moisture management Ortholite® footbeds, the Mako II’s are setting the new standard in performance and speed. The aggressive blade pitch allows for a more powerful stride, with less effort, while the flexible tendon guard creates a wider range of motion. Sports Etc Performance To Value Rating– 7 out of 10- A great choice for an elite level skater, looking for a skate built for speed. The fully heat moldable skate creates a truly customizable fit, unlike any other skate.